The five vertebrae in the lumbar region of the lower back are the largest and strongest in the spinal column. However, because the weight of the whole upper body rests upon the lower back, lumbar pain and stiffness is the single most common problem of the muscular and skeletal system, accounting for more sick days than nearly any other medical condition. During their life, 80% of people will experience lumbar pain at some point, and many will be plagued by it for a large portion of their adulthood. Due to the frequent occurrence of lower back pain and its effect on the quality of life, chiropractors have developed considerable skill and experience in dealing with it. Since lumbar pain can be caused by several conditions, having a knowledgeable chiropractor is particularly important in order to choose the correct form of treatment and help to prevent recurrence. 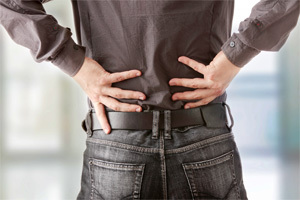 The majority of lower back pain is due to muscle and ligament strains and sprains of non-specific origin, usually through a combination of overuse, overloading (carrying or lifting heavy objects), poor posture and lack of exercise. Non-specific back pain is benign in that it is not caused by a structural problem in the spine, but can still be immensely painful and disabling for the time it takes the muscles to heal. Scoliosis - improper curvature of the spine. Facet syndrome - inflammation of the spinal facet joints. Facet joints protect the spine from excessive movement and can be damaged by sudden movement, leading to pain and stiffness. Spinal osteoarthritis (spondylosis) is an extreme case of facet syndrome caused by age-related degeneration of the facet joints. Herniated (slipped) discs - trauma or overloading may cause damage to the discs of cartilage between adjacent spinal vertebrae. As a result, the soft inner part of the disc may bulge through the fibrous outer covering, usually leading to much pain and inflammation. Sacroiliac syndrome - inflammation in either the sacrum or iliac bones of the pelvis, causing acute lower back pain. Inflammation may be caused by either too little movement (hypomobility) or too much movement (hypermobility) in the sacroiliac joint. Hypomobility is usually the result of joint degeneration, whereas hypermobility occurs when the ligaments become overstretched and loose. Pregnancy - lower back pain is common in pregnancy due the extra load placed on the spine. Some causes of lower back pain will resolve themselves within a week or two, but can be helped along by a qualified chiropractor. Even minor damage to the spine and related muscles can leave a weakness in the affected area and put you at risk of the pain returning. More serious lumbar conditions are also known to respond well to chiropractic manipulation and treatment, and provide a good alternative to either long-term use of pain-killers or invasive surgery. In addition to treating your condition, chiropractors can offer a great deal of advice regarding exercise and lifestyle choices in order to keep your back as healthy as possible and prevent the distress of ongoing and recurrent injury.